Sherbet Media is delighted to be working with Mirabelle Communications and Boohoo which is one of the most successful online retailer brands. 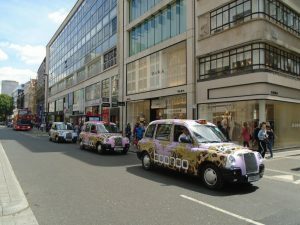 At the beginning campaign included bright pink and gold full wrap taxi following a new creative ‘Paisley Scarf‘ print in three colors – Pink, Lilac and Blue. 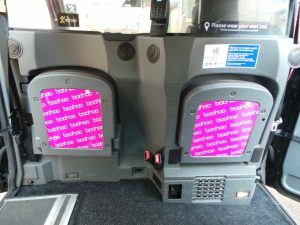 Londoners can enjoy iconic taxi experience with Boohoo branded tip seats, receipts and free WiFi throughout the journey. As a part the campaign, Sherbet Media provided exclusive VIP pick up service for the brands PR events. Our hand picked and carefully selected Sherbet drivers were attending the Boohoo and Nasty Gal’s press day in Central London as well as collection launch parties and the London Fashion Week 2017. List of celebrities includes Gemma Collins, Stefflon Don, Talia Storm and Tiffany Watson. 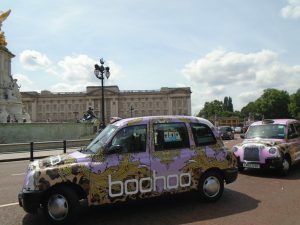 As a part of national campaign our Boohoo taxis are on the roads across the country.